At the beginning , there was a gathering . 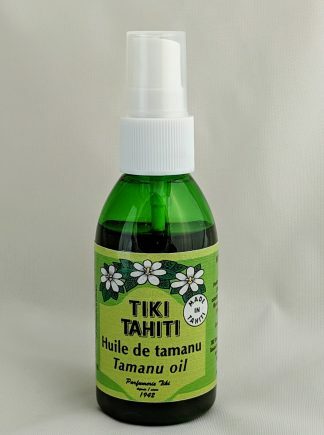 Nested in the Pacific ocean, the concept of suntan oil , symbol of a new lifestyle , was gathered with 2,000 years of traditions in paradise – the Monoi, a fine nut oil fully rich of coconut and fresh Tiare Tahiti flowers. In Europe and the United States, having fun in the society, happiness of holidays are being born , and with them on the beaches, the creative explosion of the perfume and the development of sun tan oils overwhelm the senses. in the precious oil . He then imagined to make a Monoi that one could carry everywhere , a Monoi whose quality and fragrance would not be altered only after a few days, a preparation which could sublimate ancestral know-how. He precisely selected the ingredients, took the essence of maceration techniques to define an updated and repeatable process. The precious oil would be filled in amber glass bottles of syrup in order to be protected from light exposure. Monoi Tiki was born. The first bottles of Monoi are manufactured in a small workspace in Papeete . Gustave Langy distributes by himself to grocery stores and perfumeries riding his bike . Quickly adopted by the Tahitians, products are shipped toward the Polynesian islands as well. Monoi Tiki becomes so popular that each home owns it close to the traditional Grandma’s Monoi. It is inside every beach bag. It is the gift first stewardesses from UTA brought back to France. By the late 70s, Monoi has become so popular that it was largely copied. Many of them are only synthetic oils with addition of coconut, vanilla or white flowers scent. 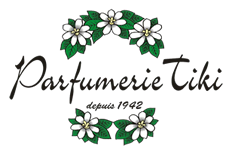 To give the product the unmistakable mark of its origins, Tiki decides to introduce an exclusive Tiare flower in the bottle and becomes “Monoi with the flower”. 10 years later, Tiki is one of the promoters for the protection of MONOI with the Appellation of Origin. This is to guaranty to consumers the quality and authenticity of Monoi, mix product of nature and Polynesian culture. Since then, Monoi Tiki Tahiti has reached the status of Original benchmark of Monoi, 100% made in Tahiti. And to fill it in small bottles of pharmaceutical syrups. For over 2000 years, Monoi is present throughout Polynesian life. It is prepared within each family with the same ingredients: coconut white flesh and petals of Tiare Tahiti flowers. But each Mum has her own secrets, know-how , medicinal and fragrant plants, process of maceration … And above all, special care for the people Monoi is made for . Love, attention, care, delicacy infused in its preparation may be the more powerful components. But in the tropical climate of the islands , these preparations are terribly ephemeral . Therefore Gustave imagined to make a carry-on Monoi which could last on a long-term. People talk about the scent of tiare and coconut . But in fact, there are miles and miles of shades depending on the time of day, how to work , respective dosage. Monoi may be more or less floral, sensual, sweet,… Gustave Langy had a precise idea of Monoi with fresh flowers prepared by his mother. Since then, the scent of Monoi Tiki Tiare has never changed , imitated a thousand times but never equaled. Small, elegant, the hand very quickly adopts the contours and does not want to part with it. Its yellow and red label, its strong and powerful name in print letters give an indelible memory magnetic image . Early in stewardesses suitcases in Papeete or U.S. bases in Bora Bora , it became the favorite product to keep a bit of Tahiti itself or to offer a small part of Paradise to family and friends. Just after grandma’s, of course ! From Mangareva, Tikehau, Hiva Oa to Rimatara, Tiki is the most popular brand of Monoi in the Tahitians heart. It is steeped in history and continues to share its fragrance in rituals of beauty and wellness. Around the 70’s , while copies appear anywhere in the market, Tiki decides to put a fresh flower of Tiare Tahiti in its bottles . Special way to mark the origin and authenticity of the product before the official labels of quality. Monoi Tiki becomes the Monoi with the flower, the absolute reference for all connoisseurs. The most sensual forms and more absolutely liberating beauty and welfare are experienced through the experience of the solar body. To provide women and men around the world a sense of hedonism and Polynesian art of life through authentic flavors and textures inspired by the traditions of Tahiti and its islands. Tiki is mostly a state of mind, a particular attention to the need of feeling well. Solar hedonism. While it is always looked for, the Tahitians seem to have an instinctive sense of happiness. Take the time , relax and let the body vibrate deeply through dance or singing, permanently feel deeply connected to the surrounding nature… and find all the principles of unlimited happiness. For over 70 years, Tiki develops products which celebrate the art of life and echo the feelings and fragrances that make all small moments of happiness. Polynesian authenticity. But this is possible only with the greatest sense of authenticity and respect for the Polynesian culture and its environment. Tiki was born on land of nature and tradition. Nothing can be considered without concern for the authenticity of the process , respect for plants and earth , the duty to give thanks to the history that precedes it. Sincerity and legitimacy have their soul in the culture. The power of “Mana”. Each formula is thus considered as a constant attention. The one for the quality of raw materials, people who cultivate , but also to everyone who love Monoi on his land- born. It is the attention paid to the development of each formula and manufacturing process. More than a brand, Tiki is a large family where the links interweave through personal care. 5 mini 1 ounce flasks of MONOI in different fragrances.Perfect for your first discovery of MONOI, as a gift or for travel.